Nancy Pelosi Understands That It’s Not Time To Spike the Ball So, When Do the Foxconn Lawsuits start? As part of the exterior landscaping, the architects of the revitalization want to remove a grove of chestnut trees that shelter between the Marcus and Kilbourn Avenue. 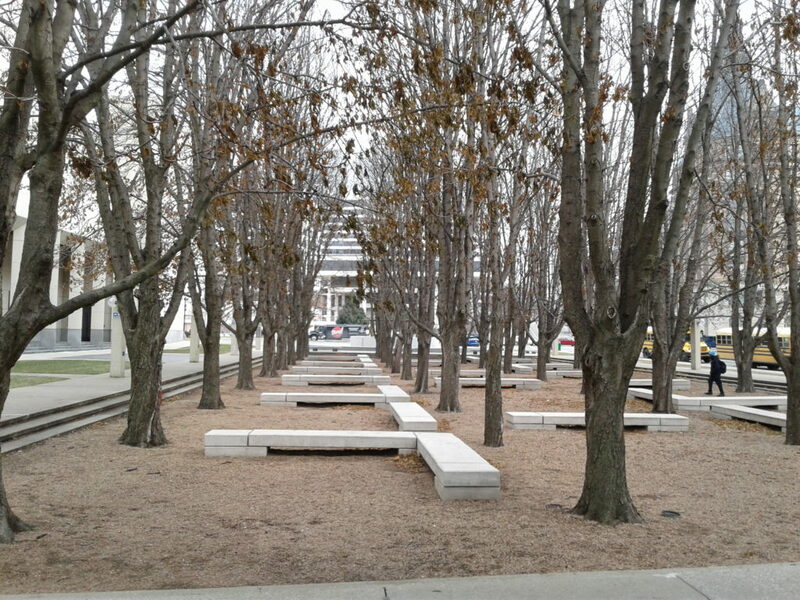 These trees are planted just below street grade with stone benches for seating and pea gravel underfoot. This grove was designed by renowned landscape artist, Daniel Urban Kiley. 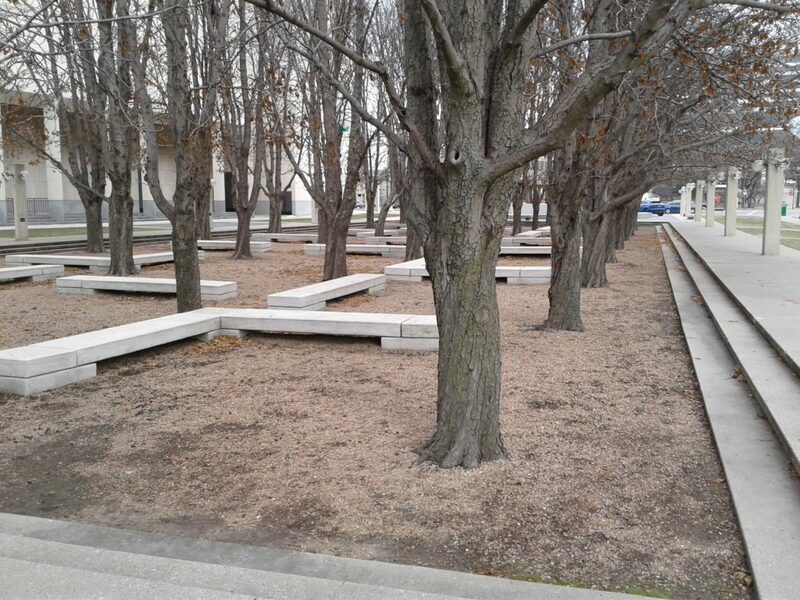 And we have another gem by Mr. Kiley, the Cudahy gardens at the Milwaukee Art Museum…so having these bookends in East Town is really quite remarkable. But that isn’t the only reason to save the chestnut grove. When I worked downtown, I often wandered over there to spend some time decompressing. Although it is right there on Water and Kilbourn, somehow it strains out the traffic noise of downtown. With a little breeze the leaves just seem to whisper their own little organic bit of white noise. To me it is a little sacred space in the city. A secret space where you can imagine yourself in a forest. Meditate. Take a deep breath away from urban stress. And good golly…we don’t need another lawn anywhere in the city. And there are great expanses of lawn in a number of county parks within walking distance of the Marcus Center including Pere Marquette Park directly across the river. The Marcus people have come up with some rationales around destroying the grove. It got little use over the last few decades…well that’s not the trees’ fault but the shortsightedness of the Marcus Center. And it has really dark shade under there. Really? Isn’t that what groves of trees are wont to do? And why we plant them? There is a reason that we call them shade trees. I sympathize with their desire to increase usage of the grounds. I suggest that they do some maintenance around the trees. When I visited there around the holidays it looked like it has suffered a bit of benign neglect. Again that lays on the shoulders of the Marcus Center. And they want to add seating for the outdoor Peck Pavilion and add performances there. That is a great idea, but maybe they can pull the Peck a bit further west or better yet turn it around with it’s back to Kiley’s grove. Haven’t any of these people attended theater in Spring Green at American Player’s Theater? The trees behind the up the hill stage add to the ambience and magic at that theater. I am going to add a few photos that I took this past December when I visited the grove after enjoying one last Big Boy hamburger at Kilowat before it closed. They give some sense of the majesty of the place even in winter. I retired last summer and I hope that in my intended future ramblings downtown, I will still be able to enjoy the Kiley chestnut grove at the Marcus Center for the Performing Arts. 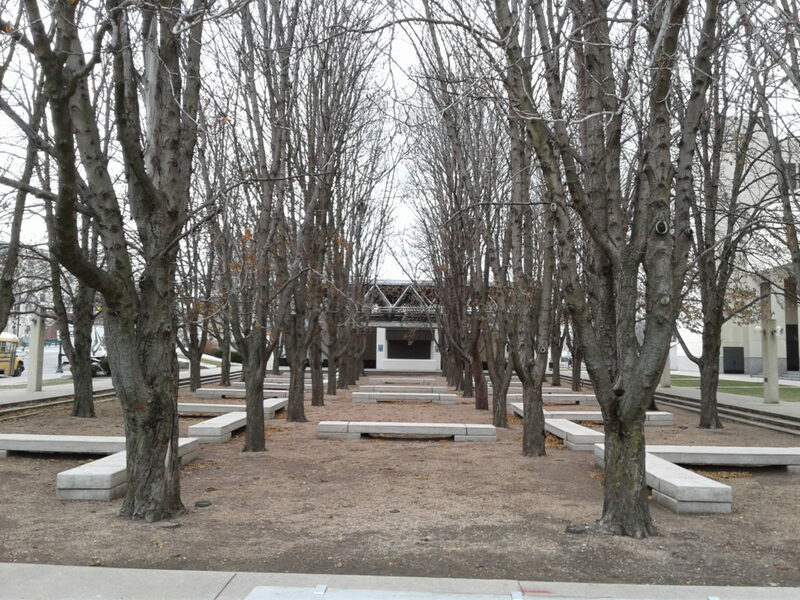 Extra credit reading: From former Milwaukee Journal Sentinel art and architecture critic Mary Louise Schumacher: Destroying the chestnut grove at the Marcus Center appeals to Milwaukee’s pragmatic side. But does it make design sense? and just a little eco-thinking here. Trees are carbon stores…lawns waste carbon every time they get mowed.